Personalized terminator rubberized sunglasses with 1 color imprint makes a perfect gifting choice for advertisers who wish to invest in gift that wraps maximum excitement and offers high branding potential. This sunglass is created using rubberized and plastic material, colored temples and UV certified lens. 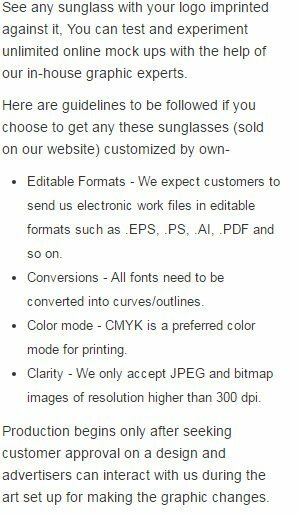 Custom terminator rubberized sunglasses make a wonderful business gift because they are loved by people in all seasons and can be teamed with any type of attire. They can be worn to any coolest, hip hoping occasion, where all eyes will be centered on fun seekers. It also serves as aesthetically hot, but coolest promotional aid for advertisers working in typically lower budget campaigns.